You might be shocked to know why bjp is going to keep the legendary Vnekaiah naidu aside for megastar after reading this. But it is a fact revealed by famous Samajwadi Party leader Amar Singh. Senior politician, Samajwadi Party leader Amar Singh in a private news channel interview says that PM Narendra Modi has decided to nominate Bollywood Megastar Amitabh Bachchan as President of India after the period of Pranab Mukherjee. As per Amar Singh the prime minister of India Narendra Modi is about to propose Amitabh's name for president of India after Pranab. He assures his statements adding that it was he who introduced the bollywood legendary actor Amitabh Bachchan to Narendra Modi during the shooting of Big B's Paa movie in Gujarat. He even added that the then Gujarat CM Modi even asked Amitabh to be a brand ambassador for Gujarat which was smoothly rejected by Amithab. Now after becoming prime minister, Amitabh becomes the prime contender for the post of Indian President according to Amar Singh, as he says that he can guess up the mind of PM. 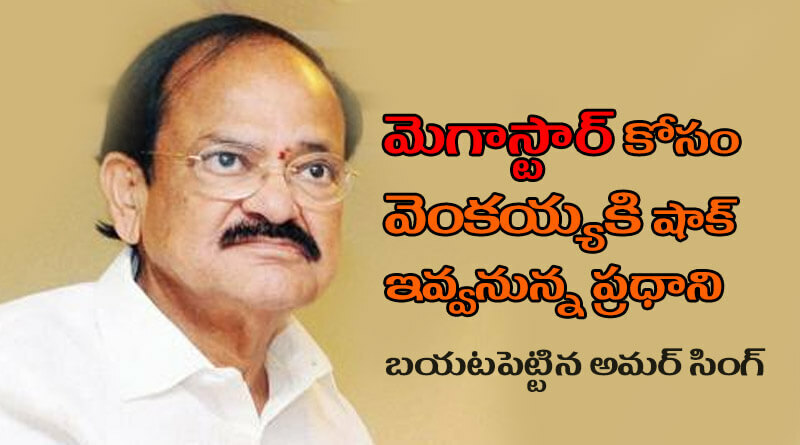 It is also known that Venkaiah naidu who completed his Rajyasabha term is waiting eagerly to heir the post of primary citizen of india for even the senior leader LKAdvani too was dreaming.